OTTAWA—Shen Yun Performing Arts will return to the National Arts Centre for its ninth season on Jan. 2–4, lighting up Southam Hall once again with its renowned production of classical Chinese dance and music. The New York-based company is visiting Ottawa for another four-show run this year as part of its 2014–2015 global tour, which is set to include over 100 cities on five continents. “This brilliant collaboration of Chinese dance and music, inspired by more than five thousand years of traditional Chinese culture, pays homage to a country that is rich in the performing arts,” he noted. At the heart of Shen Yun’s performances is classical Chinese dance, along with traditional Chinese folk and ethnic dances. State-of-the-art digitally projected backdrops provide the background scenery, an innovation in the world of dance pioneered by Shen Yun. Ottawa is the third city on the Canadian leg of the tour this year, following Hamilton and Kitchener, which hosted two shows each on Dec. 27–28 and Dec. 29–30 respectively. Audience members at those two venues showered the show with warm praise. Dance teacher Lacey Benedetti was especially impressed by the large-scale dances when she saw the show in Hamilton. “I was quite taken with the formations and the treatment of groupings, and I thought that the dancers had an exactness and precision in working together through the choreography—just the attention to detail in how they were able to achieve such visual results together was wonderful,” she said. Syd Bolton is a tech commentator/writer and founder of the Personal Computer Museum in Brantford, which boasts the largest known collection of computers and video games in Canada. With his expertise and interest in technology, he found the striking digital backdrops most fascinating. This splendid showcase, more elaborate each year, has captivated audiences all across the world. “I loved how there was an integration of both technology and dance together, and I thought it was very well choreographed,” he said. In a story-based dance called “The Fable of the Magic Brush,” he noted how the movements of the dancers and the brush perfectly synchronized with the animated scenes. Veteran cinematographer and producer Sandy Thomson applauded the talent and hard work behind the production of the show. In Kitchener, mezzo-soprano Jennifer Centrone particularly enjoyed listening to Shen Yun’s unique orchestra, which has traditional Chinese instruments leading the melodies backed by a full Western symphony orchestra playing the foundation. “It is so different than a traditional Western orchestra, so you can really hear these [Chinese] instruments shine through,” Ms. Centrone said. Cam Guthrie, the recently elected Mayor of Guelph, is a local businessman and a musician. He attended the first performance in Kitchener on Dec. 29. “It’s absolutely amazing. The choreography is great, but there’s also a story to every dance and so you find yourself really looking deeply into each routine to get a great story out of it,” he said. 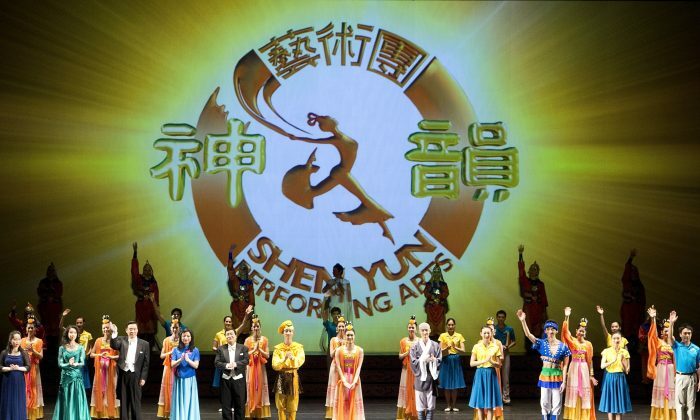 Shen Yun’s dance style is built upon classical Chinese dance, which has developed over thousands of years, soaking up profound wisdom from every era and dynasty. The expressive art form is employed in some dances to tell of China’s ancient myths and legends. “I’ve learned quite a bit. It really opened up my mind and my eyes and my heart to quite a bit more about the Chinese culture that I did not know before,” Mr. Guthrie said. Dr. James Orbinski, an Officer of the Order of Canada, accepted the Nobel Peace Prize on behalf of Doctors Without Borders in 1999. The story-based dance “The Power of Compassion” stood out to the renowned humanitarian practitioner and advocate. “I thought that it was a great performance in that it illustrated the power of caring for others, and it was wonderfully done,” Dr. Orbinski said. While Shen Yun’s performance takes the audience through 5,000 years of civilization, that dance, in particular, shed light on the plight of people who are persecuted in China today for practicing the spiritual meditation discipline called Falun Gong (also called Falun Dafa). During the remaining Canadian leg of the tour, Shen Yun will play in Ottawa Jan. 2–4, Montreal Jan. 7–11, Quebec City Jan. 13–14, Mississauga Jan. 16–18, Vancouver Jan. 16–18, and Toronto Jan. 21-25.